In conjunction with the research and consequent steps taken to begin work on and therefore eventually complete my custom wig, I wanted to share, where I am currently with the essentials of wardrobe that is discussed in realm of this sloppy category! 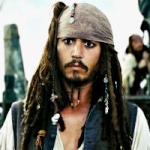 As with every element that is the outline of my (our) adventure in becoming the Captain, I have joined so many of you in performing countless hours of research and mind numbing, sleep preventing, thought provoking pontification regarding the subjects contained within this important sub conversation: mainly the Waistcoat, Frock, Sash, Shirt, and of course the Grey/Blue/Brown/Greenishly Greyish Blueish Brownish Breaches! The resulting action after looking into nearly every available option for prefabricated pieces was the application of and therefor applying said application of some good old fashion relationship building and one of our few pirate practices that does not require the end of a sword, yet has very well been known to lead to the bottom of a bottle or 3, yes, Bartering as it were: The exchange (goods or services) for other goods or services without using ones own money or the shedding of ones blood nor guts); I have been blessed, OR cursed (and oh how often it is that the greatest of curses lead to the sweetest of victories) with the opportunity to work directly with a very talented seamstress located in my current port of call that is performing the necessary and not so necessary steps, of bringing Captain Jacks custom wardrobe to life! There are a number of options out there that would certainly work "as is" depending on ones desired level of adventure, and even more that would work as a base piece to then build on, however, as with the from scratch wig option, having the opportunity to contribute to the entire design process from concept to finished piece is a ridiculously rewarding experience and one that I take feel absolutely blessed to relish! 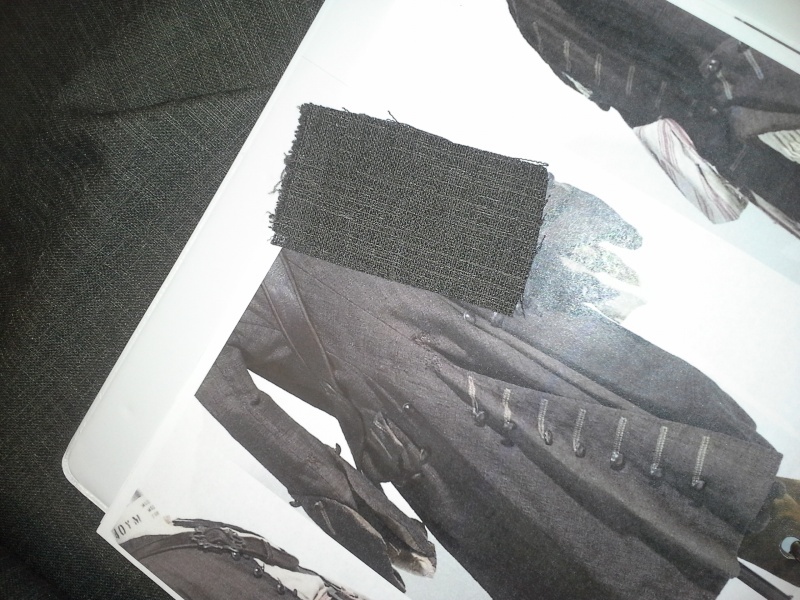 Comparison of the material selected for the back of Captain Jacks waistcoat. Material that I selected for the lining of the entire waistcoat. 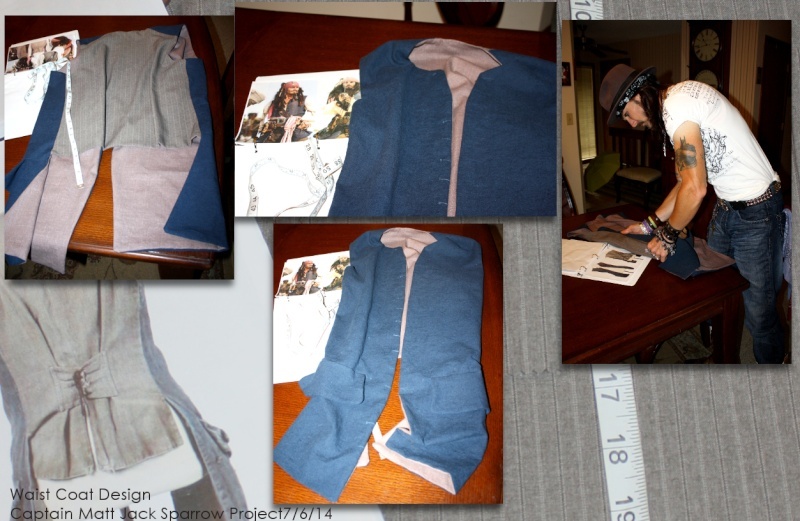 Collection of images of waistcoat in progress and my initial inspection. 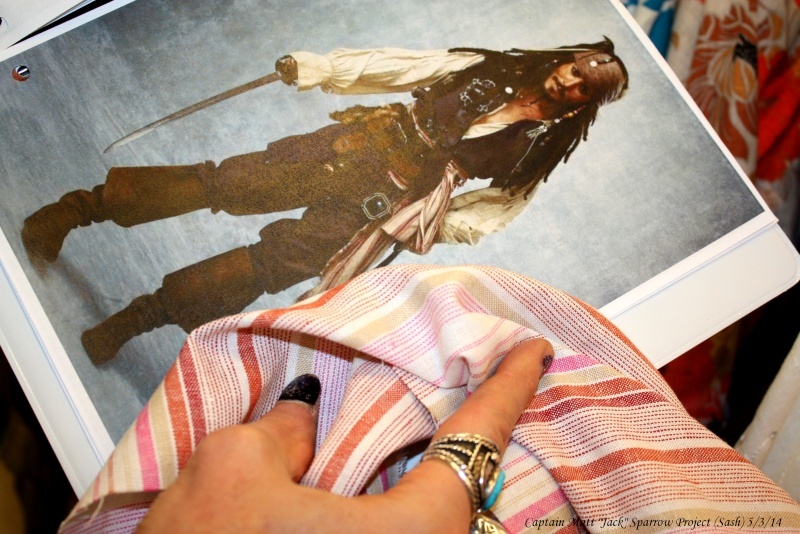 The initial fitting of what will be Captain Jacks beautifully distressed waistcoat. Minor adjustments are being completed, however, the initial fit and the stunning quality of this piece raised my inner Jack's excitment to goose bump enducing levels and blew away my tough expectations. Next step: I am currently in the midst of commandeering the necessary hardware to complete this piece. 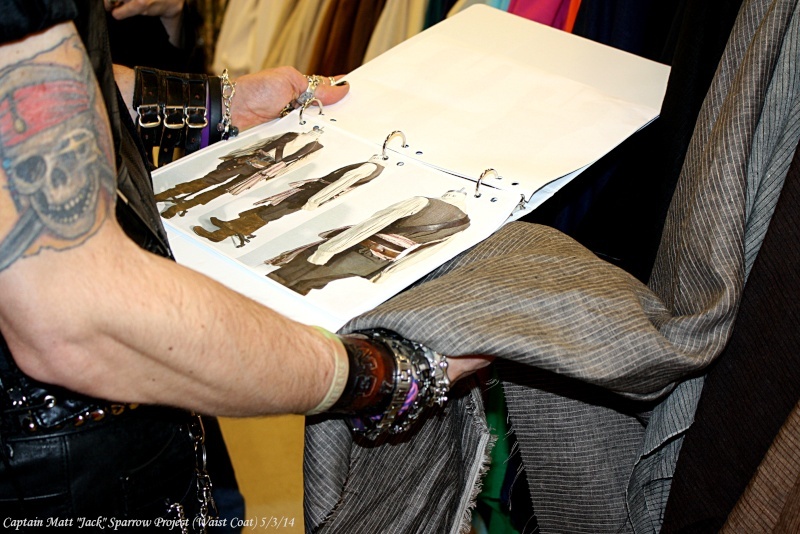 * The Frockcoat is still in the early stages of planning and material/hardware selection. 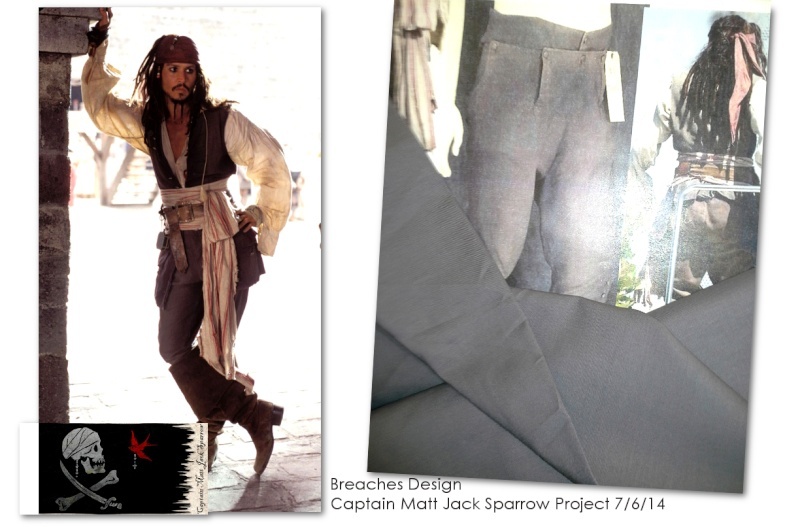 Image of the material that I have selected for Jack's custom Frockcoat and a shot of the screen used coat from Jacks Sparrow Costuming. This is an absolutely gorgeous charcoal gray silk-linen tweed with hits of brown that I just so happened to stumble upon, hidden underneath a number of other rolls of material, at a local fabric store! It is most certainly the most expensive material that will be used in Jack's wardrobe. The shirt is currently in the planning stages. We are using a drop shoulder pattern similar to that used in the creation of the screen used versions. 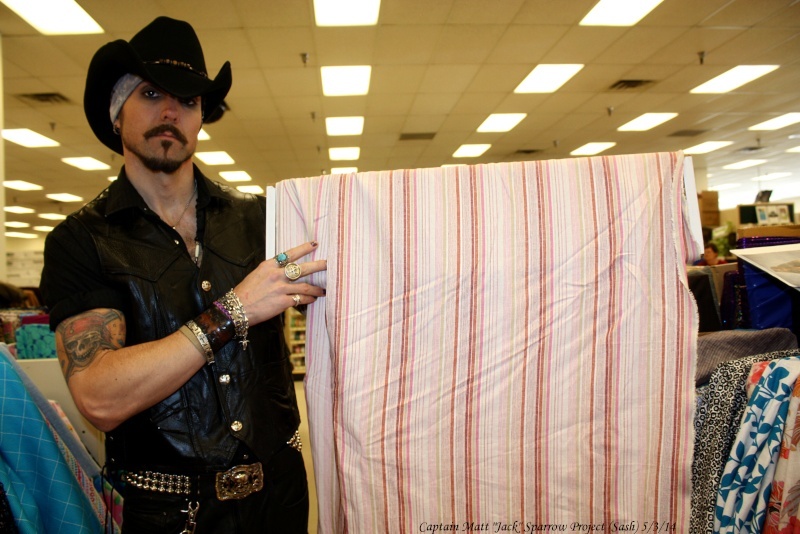 Currently, we are going to experiment with some old and wonderfully used cotton sheets that my beloved mother gave to me for Jack's purposes. 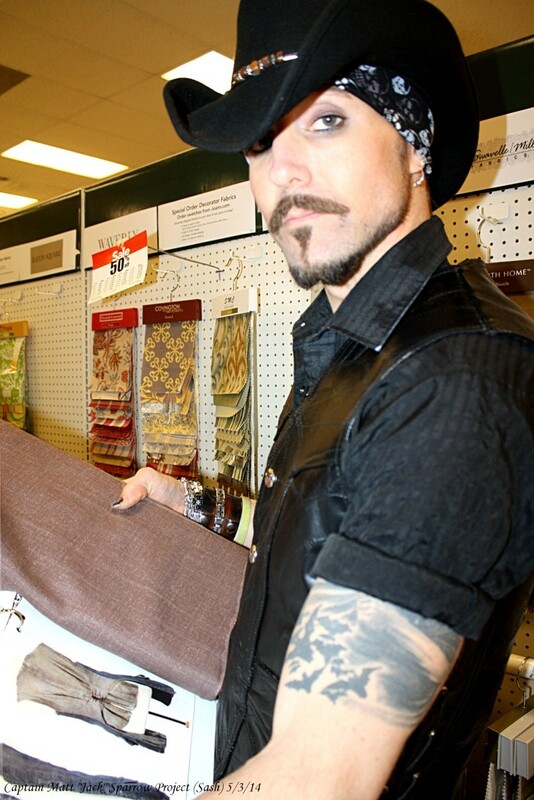 I am currently, in the market, for an alternative cotton or linen material option and the materials for the tassels. If you have any insights into this or any of the gloriously maddening subjects we gladly allow to consume our thoughts...please do so! The mysterious breaches are currently in the process of being created as Donna has the material I selected. 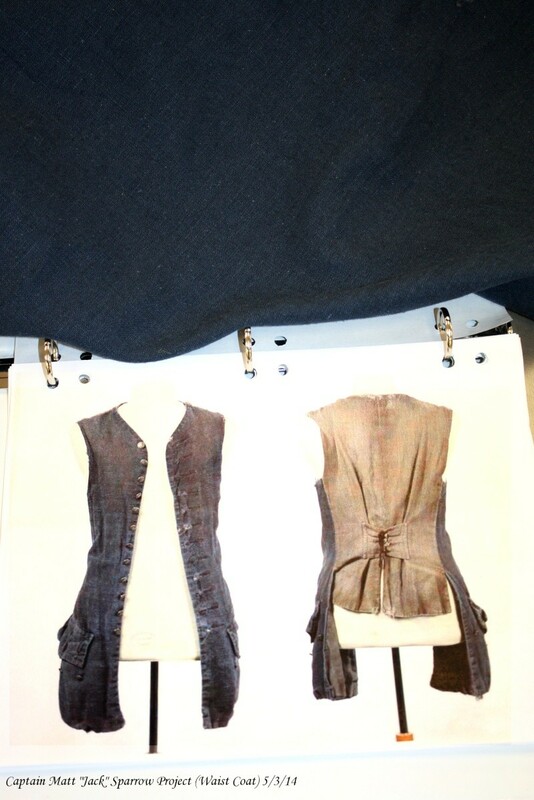 She is using a period patter for drop front breaches that will be customized to suite a more SA appearance. I am currently looking for hardware. A photo of the material that I selected for Jack's breaches along side a shot of Jack during the initial stages of costuming for CBP, a shot of one of the screen used breaches from Captain Jack Costuming and a rear shot of JD on set. I chose a more grey/blue material vs the brown/tan. Updates will be posted soon! Please feel free to offer opinions or advise as the adventures unfold! great work and awesome project! Materials and fabric for frock coat, vest and breaches seem to be very screen accurate and perfect! But, sorry for that, I'm not happy with the fabric of your sash... maybe it would be the better choice to purchase a SA sash from the well-known vendors around. I'm very interested and curious in your project and the efforts you're making. So please, keep us informed and stay "on your course Captain"...! 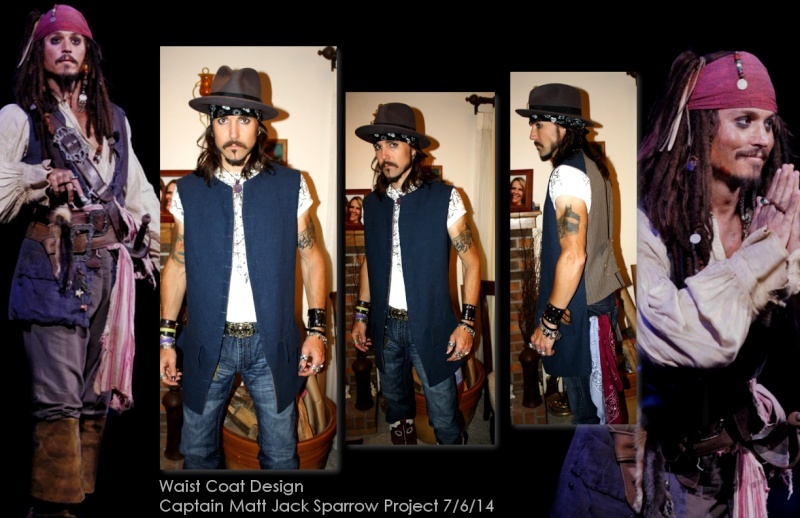 MWE&D: ADVENTURES OF CAPTAIN JACK - MAJOR FROCKCOAT UPDATE POSTING SOON! A Great Day is upon us and I trust that all of you shall enjoy the energy within it! Today I am posting some exciting news on my Frockcoat design - important enough to Jack that I am posting as a new Topic! Strapping myself in because this is going to be a wild ride! Looking forward to your progress, Matt!